Brown Brown: Fasten Your Seatbelt! "Ladies and gentlemen, this is your Captain speaking. I'm Captain Dhaliwal and assisting me in the cockpit today is First Officer Siple. We have reached cruising altitude and you are free to roam about the cabin. 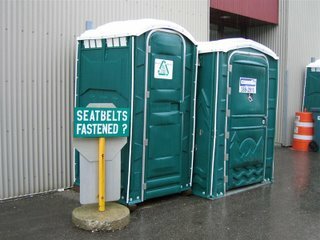 However, while seated, please keep your seatbelts fastened, especially if you plan to use the lavoratory. You don't want to be tossed around the pooper and have crap flying at you at the speed of sound. It could get messy! If this happens, Senior Flight Attendant, White, will be able to assist you. Sit back and relax, we won't get you covered. Thank you for choosing Trans Pooper Airlines!" p.s. I took this picture as I was leaving the Air National Guard base in Burlington Vermont after watching the Airshow, and the static displays.